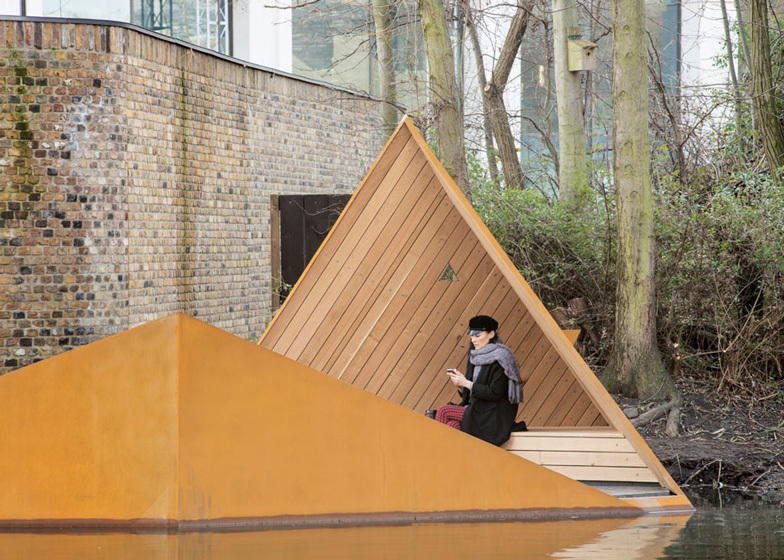 Amidst the fast-paced construction of King's Cross in London, young Finnish studio AOR has installed an angular canal-side platform where visitors can make contact with some of the local wildlife (+ slideshow). 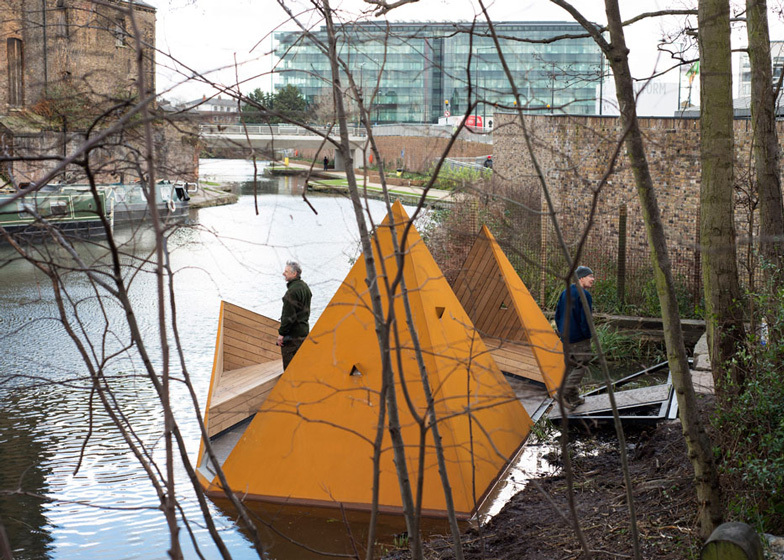 Named Viewpoint, the floating structure sits over the Regent's Canal on the edge of the Camley Street nature reserve. It provides a habitat for birds and bats, as well as an outdoor classroom where people can learn about the surrounding flora and fauna. AOR architects Erkko Aarti, Arto Ollila and Mikki Ristola based the structure on traditional Finnish Laavus, which are shelters used during hunting and fishing trips. It comprises a small cluster of triangular volumes that form hideaways and seating areas. 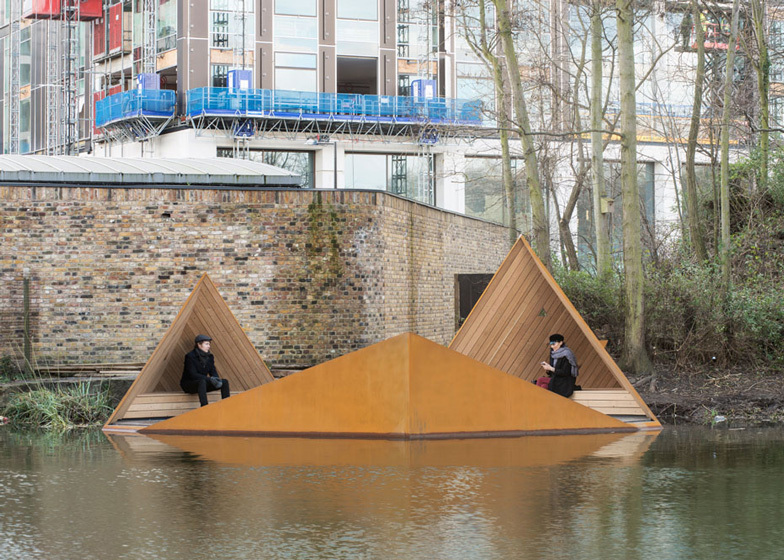 "Basically it's a floating platform where people can go and have a view along the river, and just have a small break from the hectic life of the city of London," said Aarti. Outer surfaces are clad with rusty Corten steel, as a reference to weather-beaten canal boats, while interior surfaces are lined with timber to soften acoustics. The concrete ground surface is imprinted with pretend animal tracks that help to prevent slips, plus triangular peepholes at the eye levels of both children and adults offer private glimpses of birds such as swans and kingfishers. "We hope that Viewpoint will have resonance beyond its modest footprint and allow the many visitors to Camley Street Natural Park to discover this natural environment - a rarity in a metropolitan city such as London," added the architects. 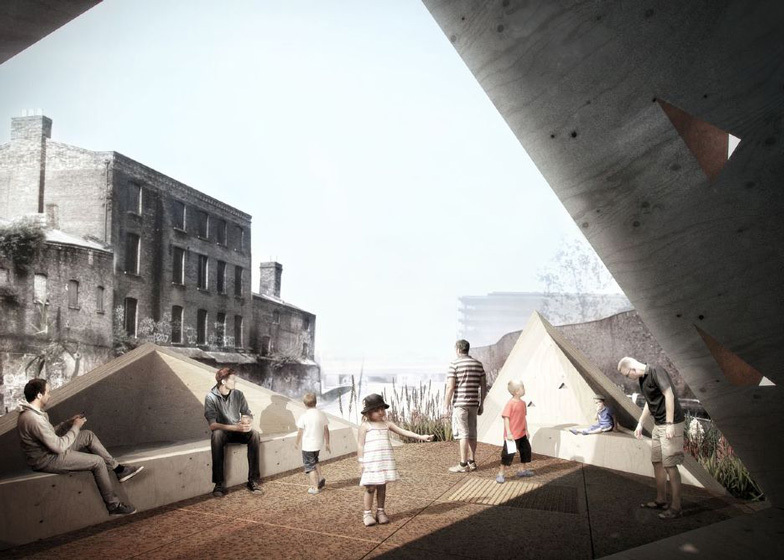 AOR won a competition organised by non-profit organisations The Finnish Institute in London and The Architecture Foundation to design the structure. It will be operated by the London Wildlife Trust. Photography is by Max Creasy. The Finnish Institute in London and The Architecture Foundation are delighted to announce the launch date for their new floating platform Viewpoint, produced for London Wildlife Trust. The joint commission designed by emerging Finnish architects Erkko Aarti, Arto Ollila & Mikki Ristola (AOR) will open to the public on 10 February 2014 at Camley Street Natural Park, located in King's Cross. The permanent structure will bring visitors to Camley Street Natural Park, London Wildlife Trust's most central nature reserve, connecting them with the wildlife of the park and the Regent's Canal. It will also provide the Park with an additional workshop space and learning facility and become an architectural focal point of King's Cross. The inspiration for Viewpoint comes from the rocky islets and islands of the Nordic. For Finns these islands are places of sanctuary, to relax the mind and get away from hectic city life. Viewpoint offers Londoners a chance to experience this escape on a secluded islet in the heart of the city. For the final design the architects were inspired by the traditional Finnish structures of Laavus, traditional shelters intended for temporary residence during fishing and hunting trips. These simple, primitive, triangular constructions are made using available raw materials such as tree branches, moss and leaves. Viewpoint offers a contemporary take on the Laavu made from materials that represent the industrial history and robust character of London's King's Cross. 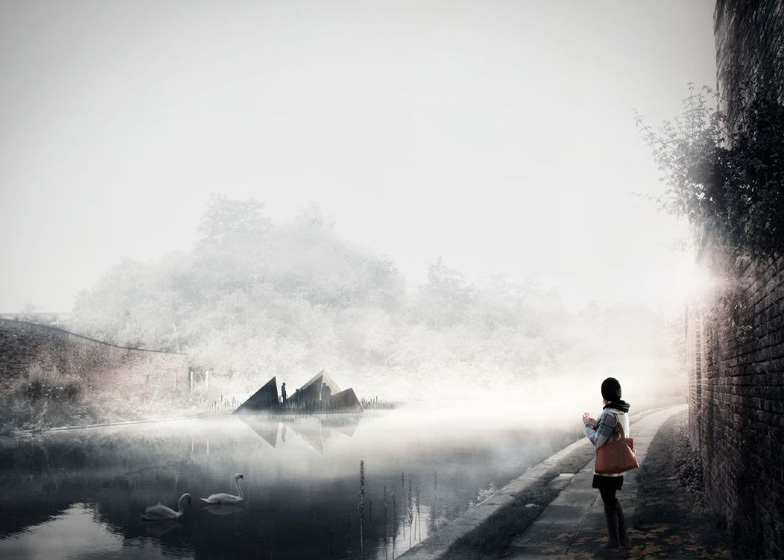 Old brick buildings, canal boats and the untamed Natural Park act as a palette of materials for the designers. The exterior surfaces of Viewpoint will be clad in dark Corten steel inspired by canal barges, changing in colour and appearance with exposure to the elements. A warm wooden interior will generate soft acoustics and comfortable surfaces to sit on, and graphic concrete with an animal track pattern will form the base of the structure, acting as both a decorative tool and slip prevention. Viewpoint will be an ideal location for visitors to reconnect with nature in the heart of London. London Wildlife Trust will also utilise the space in their educational programmes for schools as an outdoor classroom, a destination for nature walks around the park and for viewing the rich abundance of wildlife of the Regent's Canal including daubenton's bats, whooper swans and the elusive Kingfisher. To offer a sense of adventure for school children the architects have incorporated small triangular openings at different heights giving new and unique views of the canal and its wildlife.